BANG Restaurant is a beautiful, city centre location perfect for hosting your next corporate meeting, conference or event. 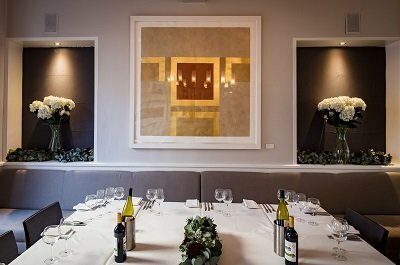 Whether it’s a boardroom meeting, corporate event or client meeting “The Scott Tallon Private Dining Room” is a contemporary, unique & memorable space. “The Scott Tallon Private Dining Room” is available hourly / for a half day / full day or for lunch, or dinner. We are equipped with AV technology & high speed wifi. You can work with our events manager to plan your meeting or event and ensure it’s one to remember. The capacity of the room is 10-30 guests. For larger groups you can choose to book another floor or the entire venue. Room rental and/or the daily delegate rate are available on request.